Do you have a hobby of surfing? Mentawai Island is the perfect place to challenge your adrenaline. This is the Indonesian Hawaii that completed by its exclusive spots. Nyangnyang Island, Karang Majat, Masilok, Botik and Mainuk are the best places to surf. On July and August, the height of the Mentawai waves can be 7 meters. This extreme tourism destination is the main attraction and very famous among the surfers in the world. 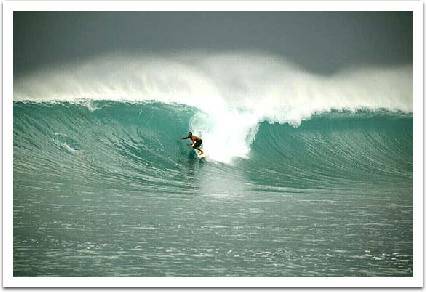 The wave in Mentawai Island is very spectacular, even it is appointed as one of the best surfing waves in the world. A total of 23 spots are international scale. This charm which makes Mentawai Island is popular among the foreign tourists as one of the challenging surfing places in the world. Now, almost in every year, Mentawai is pointed as the organizer of World Champions Surfing Series that is scheduled on every August. Besides the big waves, Mentawai’s beaches are also so exotic with a coastline length of 758 kilometers. Tourists from various countries usually come to enjoy a lot of attractions on the beach. Besides the authenticityand beauty of the forest in the Mentawaiwillbea memorable experience for you. Mentawai is also rich in some endemic protected species, some of them are primates such as Simakobu or pig-tailed monkeys (Simias concolor), Bilou or dwarf gibbon (Hylobates klossii), Joja or monkey Mentawai (Presbytis potenziani), Bokkoi or macaque Mentawai (Macaca Siberut). With all of the exotic that it has, Mentawai Island become one of the adventure tourism destinations, culture and maritime that are interesting to be visited. Mentawai Island is a part of West Sumatera Province, Indonesia. The majority of the inhabitants of these islands is Mentawai tribe. Mentawai Island consists of a series of non-volcanic island where a cluster of islands is the culmination of an underwater mountain ridge. The four islands that make up the Mentawai Islands are Siberut Island, Island Sipora, North Pagai and South Pagai Island. Mentawai Island also offers us a tracking attraction by passing the pristine tropical forest, enjoying the lifestyle of indigenous peoples living peacefully in it. Mentawai is an area which unspoiled by human and a lot of modern infrastructure.